ASK ANY SMART fly shop owner and they’ll tell you that there’s good money to be made in “soft goods.” Anglers not only rely on specialized apparel that helps them stay dry, or warm, or cool in various fishing environments—and there’s also a “lifestyle” appeal for fishing wear. We want to look like anglers. And these days, that doesn’t necessarily mean wearing an olive drab cotton shirt with extra flaps and pockets. Apparel also has strong gift appeal. You might not want to pop for a $700 rod, but odds are that most everyone who reads this is going to pick up at least a shirt, or a hat—for themselves or someone else—within the next year. Of all the niches in fly fishing, the apparel realm is where the design and production boundaries are being pushed the furthest, fastest. And that is especially true when we look at the lineup of new apparel options being introduced in 2012. Sage (that’s right, the rod company, turned rod company that makes reels as well), is now making a big push in the apparel market for the very reasons we just explained. New for 2012 are the “Quest Softshell Insulated Hoody,” a Primaloft jacket that can be worn as a base layer under the rain jacket, or alone on cool evenings (or in the shoulder seasons). Sage is also launching a “Geoshell” waterproof, yet breathable jacket, as well as flats wear like the “Keys Crew” (a polyester shirt with UV protection), and the “Seychelles” convertible pant. Sage’s sister company, Redington (both Far Bank Enterprises brands) is also out with new designs, including a “Sonic Pro” nylon waterproof jacket, and “Redilayer Wool” base layer pants and crews on the more “technical side,” and the “Shuttle Pant,” women’s “Crystal Waters” skirt, and “Bella Coola Quilted Vest” for fishing and/or just kicking about town. 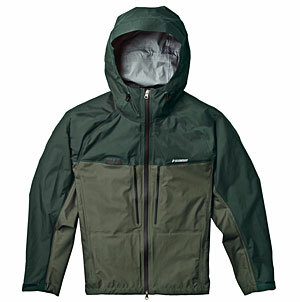 Frogg Toggs has a new “Breathable Guide Jacket,” and Aquaz USA is introducing a new “Trinity” wading jacket. 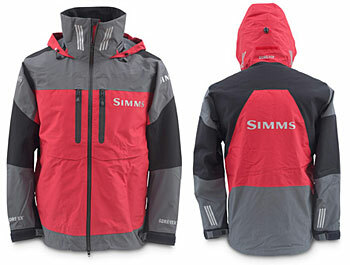 Of course, the major players Simms and Patagonia have designed a number of new apparel options as well. For its part, Simms made a huge splash with foul weather gear it designed with input of tournament bass anglers—the ProDry rain suit—that took “Overall Best of Show” for all products at the International Fishing Tackle Dealer expo. The fact that a product that was designed for other types of fishing won best product at a fly trade show demonstrates just how hungry dealers are for crossover appeal. There’s no doubt that ProDry is in a league of its own. Anglers will also want to check out the “Flyte” jacket, and NFZ Techknit shirt (for women), among other new Simms apparel offerings. Patagonia always makes smart, functional product, and in 2012, anglers will see a new “River Salt” jacket, an extremely tough design made from H2NO fabric, as well as a very comfortable Merino Wool shirt, a “Slick Calm” shirt and “Home Waters” shorts. Buff only seems to be growing in appeal among anglers, and in 2012 the company introduces a “Bug Slinger” series, as well as “Water Gloves” that offer U/V protection. You’ll also see a “Redneck Gator” from Montana Fly Company, and “Halo II” from Halo Headband, as well as various products from Glacier Outdoor, Flood Tide, and Kast Gear. Lastly, two companies that have made major statements in the fly world in recent months have been Howler Bros. and RailRiders. Howler Bros. is out with some very cool (literally and figuratively) “Pescador” and “Guayabera” shirts, while RailRiders introduces “Bone Flats” shirts and pants. Anglers are going to find a number of technical apparel options that will keep them drier, warmer, or cooler. Style is a matter of personal taste, but we can safely say that clothing options are trending away from grandpa, and very much reflecting a lifestyle that revolves around rivers and flats.